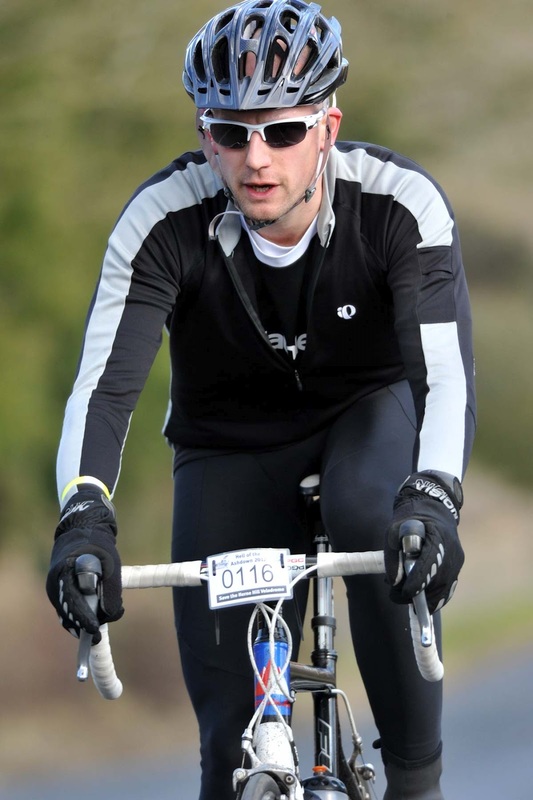 I had a certain amount of trepidation going into this sportive. As I said previously I had a bad experience in 2010 with this course, and because of that I've always had demons to clear. I signed up in November last year when entries opened - my friend Chris signed up too, and we secured the same start time of 09:02am. There are two route options, a "100km" route (actually 106km), and a "50km" route (actually 53km) called "Devil's de Tour". Chris and I signed up for the 100km version, and Mrs fancied taking on the challenge too and, seeing as this was her first organised bike event, she opted for the 50km route (her race report is here on www.totkat.org). A good plan - Chris had done the same thing last year. My car is "in the shop" and so I have an enormous Audi A4 Avant of boat-like proportions for the week as a loaner car. It swallowed the bikes and associated kit like they were a small snack. You could ship freight containers in this thing - I love it! We signed in and relaxed with a cup of tea ahead of our start time. 9:02am came and, after a quick commemorative photo, we set off. Chris (L) overloading the CCD with his jacket and me (R) posing ahead of the "Hell"
Chris and I had agreed before hand that we weren't going to race each other, we'd play it by ear and if one of us naturally pulled away we'd just roll with it. Right at the start there's a massive hill - don't let it knock your confidence, it's short and sharp and soon over, then it's into the ride proper. I was a little restricted on the flat and downhill due to having a faulty front mech - I couldn't move onto the big ring at all, nor could I use the smallest cog on the cassette. I knew previously that I had been having some gearing problems, but thankfully, it being more about the uphills than the fast rolling flats, I wasn't too crippled. First lesson: Always check your equipment well in advance of the event. The first 30km flew past, and we made it to the first of the two feed stations in what felt like no time. There were two climbs I remembered from both years as being Big Climbs that Deserved Respect - the first was encouragingly named "The Wall", and came just after the stop. It's quite distinctive as you round the corner at the bottom and see it stretching up ahead of you into the sky. 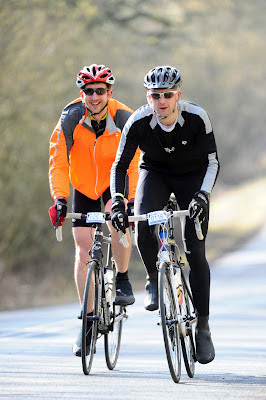 On the climbs, Chris was pulling away from me - he had a wider ranged cassette so he could stay sat down and plug away keeping a good cadence while I ran out of gears and needed to get out of the saddle a bit more. I caught up over the brows of the hills though, so we ended up staying together the whole way round. Second lesson: Think about the gearing you will need in advance, and make sure you've selected a cassette with an appropriate range (and appropriate chainrings to match). The Wall, despite its imposing name, wasn't the mountain I remember. I felt quite good on the way up, and had plenty of energy left for the shallower climb that ran on from the top of the steep section - overtaking a dozen or two other riders on the way and catching back up with Chris. It was disappointing not to have the high gears I needed to really take advantage of the rolling ups and downs, but with some occasionally comedic high cadence moments I don't think it held us up too much. I flew up the hill I remember walking up near to tears two years previously, and we made it to the second feed station in high spirits. I knew it had taken around an hour and a quarter the last two years from the second feed station to the finish, and there was only the mighty "Star Hill" between us and completion. Again, I had this obstacle pretty much the size of Everest in my head, and was amazed that I just dug in and rode up it. I put in a couple of higher cadence out of the saddle moments, but most of the rise was sat down, plugging away, and overtaking people. What a different experience to the last two years! We finished and rode over the timing mat at precisely the same time in order to get an equal time - though it transpires that Chris must have crossed the start mat a second behind me, as he ended up one second quicker! Bah! I finished 369th out of 956, one place behind Chris, in a time of 4:37:31 - absolutely smashing my 2011 time of 5:23:27 (a 46:56 improvement) and 5 hour target. My secondary objective was to break into the middle third of finishers - as it was I was 39% down the field, so very nearly made it into the top third! I'm really very happy about the result, even my most positive estimate put me at 4:45:00 - and I know with a bit less hanging around at the feed stations and having all my gears to hand (or foot) I could knock another few minutes off the time. So I think next year's challenge is to break 4 hours. My bottle full of gels was an interesting experiment. I didn't get sick of the taste at all, but the liquid was a bit too viscous to eat easily through the bottle nozzle. With a bit of adjustment I think it could be a winning formula though, and certainly an order of magnitude easier than fiddling with individually wrapped gels. I was particularly pleased about my heart rate - the majority of the time was spent in Zone 1, with 55 minutes in zone 2, and just under 7 in Zone 3. This means for the most part I was well under my functional threshold which means I have more "in the tank" to commit without crossing over into a level I couldn't sustain for an endurance event. This is what endurance training has given me, and proves that I am building a good aerobic base. There's a lot more work to do, but - just like my recent 5km PB - it's a great motivator to see real results-based evidence. Mrs had also done amazingly, and smashed her target with an amazing 02:26:14 finish. She was second female (the margin was under 2 minutes - she's blaming chatting at the feed station for that! ), and beat most of the blokes too, coming a stonking 4th overall! Check out her position in the results table here. My Garmin plot for the event is here. I got some odd looks when upon finishing I ran into the cafeteria, changed my shoes, and ran out! The 15 minute run I'd been advised to tack on the end was a real eye-opener. I remember the leaden legs I had at the Thames Turbo races last year, I had no experience of running off the bike at all. I'd by lying if I said that my legs were feeling fresh as I ran out - but certainly the long runs and brick sessions had helped. I kept cadence high and form good (and pretty much sweated to death due to running in bib-tights and two tops on the hottest day of the year so far). A few of my favourite photos from the event, taken en route by Sportivephoto Limited. Am now very happy, no longer scared of the Big Hills, and actively looking forward to next year and the sub-4 hour challenge! Thank you Catford CC for a wonderful event, friendly and welcoming atmosphere, and brilliant marshals. 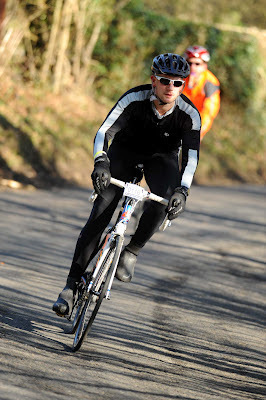 Tomorrow is the first event of the year, "Hell of the Ashdown" organised by Catford Cycling Club. A choice of 55km or 110km sportive in and around the Ashdown forest (in, around, and crucially up and down). It's all about the hills. Cudham Test Hill – New in 2009, this literally gives a short sharp shock in the first mile or so. Don’t worry if you have to walk the 1 in 4 stretch at the top because in any case we ask you to dismount to turn right at the T junction. Toys Hill – You'll need to settle in for this 2 mile steady grind. "The Wall" - This daunting climb was considered so hard that the Tour de France gave it a miss when the stage went over the Ashdown in 1994. On the Ordinance Survey map it’s steep enough to warrant a 'chevron' on two stretches. Although Kidds Hill is 1.5 miles long you will climb for a total of 2.5 miles to the summit of the Ashdown Forest at King's Standing. "Nouvelle Col de Groombridge" - A new addition to the HOTA which we have just discovered. This narrow lane soars skywards seemingly forever. Bayley's Hill – New in 2009 it replaces Ide Hill. We are not surprised if you've never heard of it because it's wisely shunned by those in the know. The quite lane starts on the low levels of the Weald of Kent and arduously toils up for about 2.5 miles, easy at first but it gets steeper until it rears up to crest the North Down’s Greensand Ridge. Star Hill – 'The sting in the tail'. This is the one everybody talks about as it is a vicious climb coming towards the end of a gruelling ride. I'm excited about this event. It's the first "proper" event since I've started the Ironman training. I definitely feel fitter and faster, and so I'm intrigued to see what difference that makes on the clock. I've entered the 110km route in the last two years. It used to be held on the last Sunday in January to make it a real winter test, but the bitterly cold and icy days they had in 2009 and 2010 meant that from 2011 it was moved to the last Sunday in February. I can definitely agree that 2010 was a true winter day of near Arctic proportions! 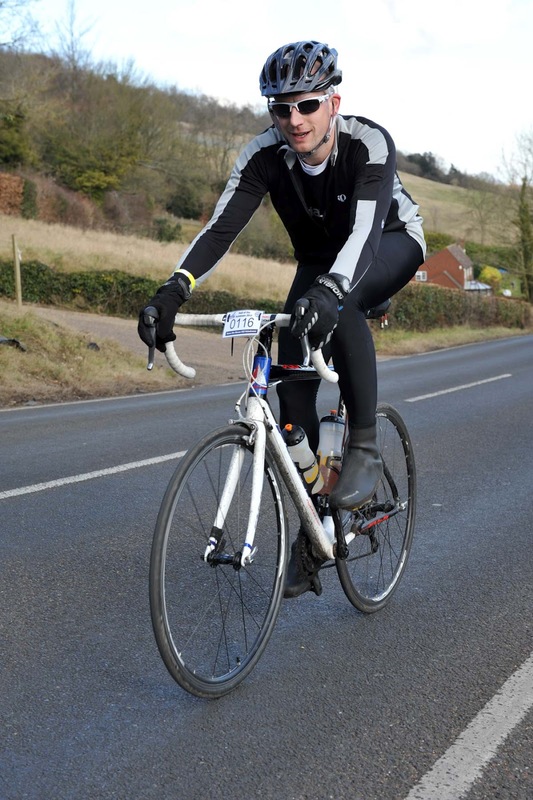 In 2010 I had my only real experience of "bonking" (the cycling equivalent of "hitting the wall") - I ran completely dry - it was one of the most horrible experiences I've ever had. I couldn't get up any hills (even a slight rise) and was so weak that I couldn't keep the bike going in a straight line on the down hills. This kicked in after about 5 hours in the saddle. I sat in a car park by the side of the road and gave up. Tried to call Mrs (or Miss, as she was then), but there was no reception. I felt sorry for myself for a while and realised that if I didn't get my arse into gear I was going to be stuck in the car park for the rest of my life. After hauling myself up, I was amazed to find the next feed station literally (and I mean literally) around the next corner. I stocked up on hot sweet coffee and the wonder that is Mule Bar, and rode the final hour to the finish. I learned a lot that day, I've never been on empty before, or since, and I never want to repeat the experience. In 2011 I had a pocket full of Power Bar products so I could fuel on the bike (or by the road) and performed much better. I also stopped at the first feed station (I hadn't done in 2010, a really stupid and junior mistake, and the primary reason for my energy depletion later). This time, I'm trying an idea for Ironamn fuelling - to put a load of liquid gels into a drinks bottle. You need to use thin liquid ones like the Science in Sport ones below, or the High5 IsoGel, otherwise the mixture is too thick to get through the nozzle. Save time, pocket space, and stickiness! There's nothing fiddlier whilst cycling than trying to extract a gel from your pocket, unwrap it, and consume it without dropping any rubbish. This could save a huge amount of time in an Ironman race, so it's a good opportunity to try it out. The bottle feels oddly heavy, and I'm pretty sure it's going to be very weird "drinking" the gels, but let's see how it turns out. We also took advantage of a good accessories sale at Evans and picked up a couple of soft bike bags - total bargain at about £35 each - 10% off total for two items, with 15% off if you buy 3 items, so we got two of these and a £1.99 water bottle. A bargain for saving the interior of the car! This year, I'd like to get sub-5 hours, but there is a different route so let's see what happens. Finishing in the bottom fifth (80th percentile or below) is a pretty poor show too, I'd like to be in the middle third (33-66%), but there are some kick-arse cyclists that do this every year, so let's just see how it goes. Oh, and just to make it fun (and more Ironman relevant), I'm tack ing a 15-minute run onto the end as soon as I finish! This weekend I had planned to go for a long bike ride with the Mrs on a route she tried out last weekend and really enjoyed. I like to get a parkrun in on a Saturday morning, and enjoy trying out unfamiliar courses, so I agreed to meet her in Kingston after my first visit to Kingston parkrun. Unfortunately all hell broke loose at the day job, so Mrs was on and off the phone over night, and again this morning. Today's ride was off - rescheduled for tomorrow. Instead we'll go for a run together later this afternoon. So that left me with a parkrun to do, but nothing afterwards. With working almost exclusively in Zone 1 lately, I have missed going for a 'balls out' parkrun, and seeing what I can do. With Kingston an easy 25 minute cycle away (a lovely warm-up and cool-down duration) I thought today was the day, let's put some real effort in and see how it goes. I arrived at the start with a minute or two to spare, and joined the group. There seemed to be about 50 or 60 people there, a good size for a parkrun on a course that was fairly narrow in places, and had a number of people to navigate who were just out walking and enjoying their non-parkrun morning (they don't know what they're missing!). I had quite a clumsy arrangement to run in, with my iPhone tucked down one glove (I fancied some music for a change today) and my bunch of house and bike keys tucked down the other glove. We set off after the race briefing and I was immediately caught behind someone slower. I held back and waited for a gap, and pulled round. I felt good, fresh from only having had a 15 minute swim yesterday, and confident. I didn't have "new PB" as the be-all and end-all, but my previous was set almost a year ago at Wimbledon Common parkrun on 5th April 2011, so I felt like an improvement was due. I went off a bit quick (as ever) but tried to keep cadence high and speed constant. I was surprised at how quickly I reeled in a few people over the first couple of km. I was running well, I knew it was fast, but it was a bit unfamiliar as I'd spent so much time at sub-150 BPM heart rate lately, and here I was well into the 160s. I haven't seen Zone 3 for a long time! I tried to wind it up on the return leg (it's an "out and back" course) and checked my watch for the only time - it said 17 minutes and something, and I was a few metres shy of 4km. I realised that means that all I needed to do was put in a sub-5 minute km and I should break 23 minutes. I wound it up over the last 500m, had a near sprint for the line, and stopped my watch. Looking down I almost passed out in shock - not that I'd broken 23, I was kind of expecting that, but by how much! I still start too fast and get slower before bursting at the end though - this suggests there's more to come just by better pacing even with no fitness improvement. Even though all my training for the last 6 weeks has been focussed on Zone 1 - I still smashed it! I'm overjoyed, and really happy to see some results from my hard work. This is definitely getting a "Gold" entry in the training diary. When I signed up for IM Wales I thought I was taking on an immense almost insurmountable task. A monumental day of challenging myself and pushing my capabilities - and I'm sure that would be the case. However, something has been nudging at the back of my head, an urge to do, well, I don't know, just "more". I know I can't take on an ultra-style event at this stage - I simply don't have the urge to try a double-iron distance race (some nutters in Lanzarote have finished just that, check out the Double Enduroman), and the concept of anything as insane as a deca-Ironman is a bit too "out there" for me right now (who knows, one day maybe...). Athletes of all abilities are pushing new boundaries in endurance racing although a fresh test has emerged which is arguably one of the hardest in Western Europe. The series of four UK and Ireland Ironman branded races is proving to be the ultimate challenge for some competitors next season. This will see athletes attempt an amazing two full distance and two 70.3 races between June and September next year. The UK organising team have agreed to provide some extra reward for athletes who are attempting the task that they are calling the Ultimate Challenge. As a result athletes embarking upon the ‘ultimate’ will receive special race numbers and a commemorative package including t-shirt, jacket and a unique medal as part of a special awards ceremony. A ‘Wall of Fame’ will also be created online to honour the success of those who can overcome the odds to finish all four races in the same season. Well, as soon as I heard about a special finishers' medal my mind was made up. Game on! I've exchanged emails with WTC and it looks like there are currently 9 people signed up for all four. A fairly exclusive club so far! After the excitement had died down a bit (and I'd parted with a sizeable volume of cash) the reality of the undertaking started to become apparent. Whereas previously I would have had 13 weeks of recovery and training between Wimbleball 70.3 and IM Wales I was now going to be significantly more pressured. 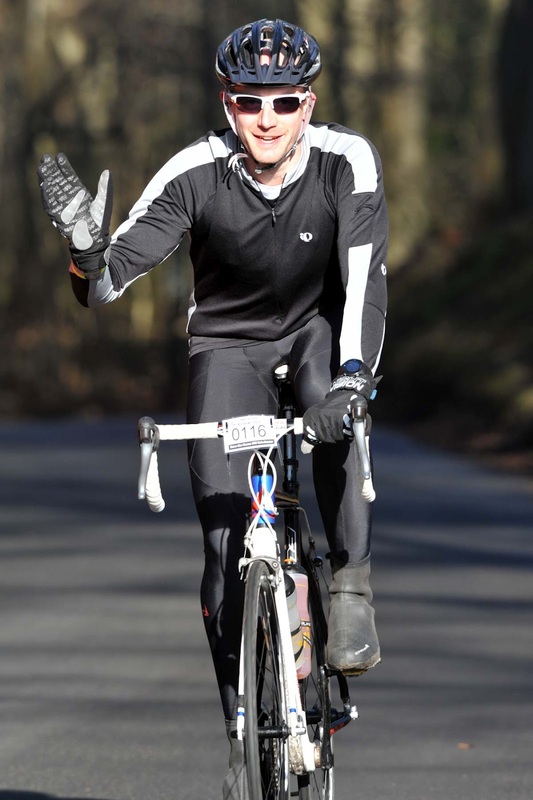 Just 5 weeks after that, on 22nd July, is Ironman UK Bolton. This means my first full distance race is now 22 weeks away rather than 30. I then have 6 weeks until 2nd September and the next race, Ironman Ireland 70.3 Galway. There is then only 2 weeks until 16th September and the fourth and final race in the series, Ironman Wales Tenby. The two weeks between that last two will be hard, very hard. There will be barely enough time to recover, so appropriate pacing will be essential. In fact, pacing will be the key to success all the way through the year, from now until September. I consider the Ultimate Challenge not to be about the distance or the individual events; it's in getting to the start line at Wimbleball injury free and mentally strong, and then maintaining that fitness and aptitude over the next three months. The 13 week recovery and training time I was expecting between Wimbleball and Wales would have really meant that I was competing in two independent races, whereas this challenge rolls the events into one three-month marathon. At this stage, 17 and a half weeks out form the first event, I'm not thinking too much about that three-month period. I'm thinking about keeping my training consistent and productive. Getting my un-swimming turned into actual swimming, building a strong endurance base, and keeping fit healthy and injury-free. It's very exciting though - I love having an adventure on the horizon, and this is the biggest one yet. Oh yes, and the Mrs is doing it too. It's her birthday in October, it's a big one and I'm already thinking about how we can celebrate. It seems a dream that by then we'll have both completed four Ironman races! It all just got a whole lot more serious…! (And that's it now, really seriously definitely absolutely definitively and categorically no more race entries for this year). My wetsuit is very old, about 8 years now. Technology has come on a long way in that time, and wetsuit design, construction, and materials are no exception. For long swims it rubs, moves around, and generally becomes uncomfortable. Not what you want in an Ironman swim. I've been very impressed with the reports on the latest Blue Seventy Helix wetsuit, so when the Legends Of Triathlon podcast auctioned one off as part of their sponsorship from Blue Seventy, I gave it serious consideration. The ebay auction was for 10 days, and was due to expire while I was on a business trip to the US. In fact, it expired while I was sat in a presentation. Thankfully there were 208 other people sat in the session too, so I could keep a half-eye on my iPad and see what was going on with the auction. I set a mental upper limit, and with a few seconds left made (yeah I'm one of those people, sorry about that) I made my bid, and... I won! The good thing about last minute bidding is the instant gratification. So, the big unknown, is I kind of assumed it would be a 2012 version, seeing as that's what everyone has been excited about lately. However, checking just now I learn that it's not out until February (though it is February now) and you can't buy it yet. So, will I get the really very good 2010 version at a bargain price? 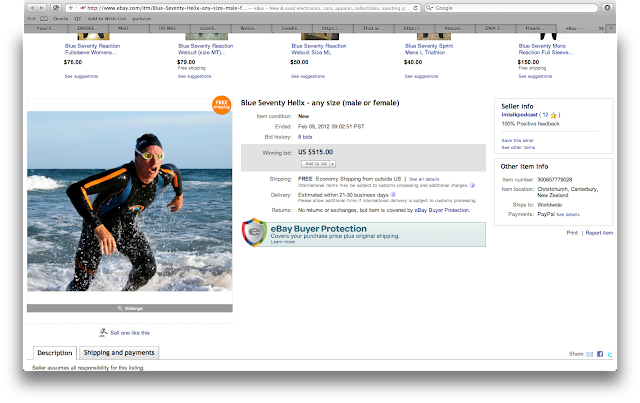 Or will I get the super amazing bar-raising 2012 version at a mega-bargain price? I'll let you know as soon as I know - one thing is for certain, it'll kick the arse off my old wetsuit! I'm currently being un-taught to swim. I enjoy swimming. I've never had a lesson (discounting getting me from zero to my 10m ribbon when I was a mere sapling). I have swum regularly in the past, 3 or 4 times a week for a few months at a time, with these bursts coming every couple of years then dying away again. My self-optimised technique involved long lazy strokes, a minimum of splashing, and didn't really push my heart rate very high. 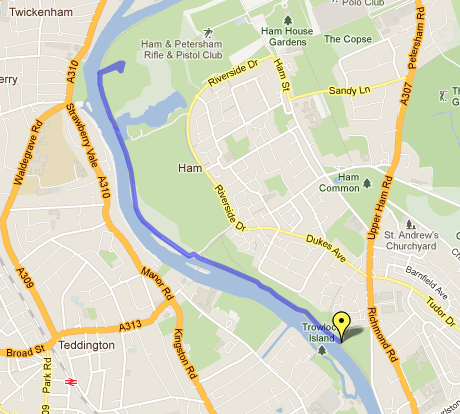 Using this method I've got through quite a few triathlons and a couple of 3.4km swims in the Thames. I thought I was doing OK, and I'd pretty much muddle through the Ironman swim with the usual minimum of fuss and hopefully no drowning. And then last year I beat Mrs in one of those 3.4km swims. Swimming was her thing, it was to her what cycling was to me. Something she used to do an enormous amount of in "the old days", less in recent years, but still a good latent talent and strong muscle memory. Being beaten by hubby was not on. She sought assistance from a professional (coach, not shrink). A few months after that we went on holiday. I got whipped to bits. Even swimming in the sea Mrs just took off - I couldn't hang on! And she hadn't even been taught to go fast yet! She's in the process of being taught to go fast and is probably putting in two lengths to my every one. So I did. I've had three coached swim sessions so far, and SwimCoach has very effectively untaught me to swim. My long lazy strokes? Wrong. The point at which I breath during a stroke? Wrong. My body position? Wrong. My catch? Wrong. My kick? We haven't discussed that yet, but I'm mentally prepared for it to be wrong. I now feel like the least coordinated swimmer that ever graced the pool. I thrash and splash along, drinking water with every breath - it's a good job pools are constantly refilled otherwise me and my fellow swimmers would have ended up beached, me having drunk the pool dry. I know there's a light at the end of the tunnel - but right now I can't swim at all. Mind over old-style has broken it, and I have no new-style proficiency yet. I know it'll come though. Practice, practice, practice. It will come in the end. I just hope it comes quickly enough so I can put in a good effort at the first Thames Turbo Triathlon, and then I need to get enough endurance in for a 2.25 miles swim when Wales finally comes round. In any case, it's going to be a long time until I beat Mrs again.